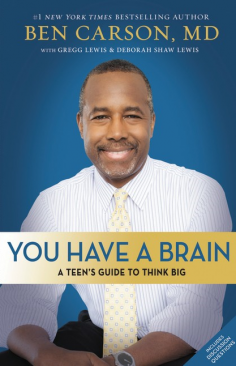 In You Have a Brain: A Teen’s Guide to Think Big, Dr. Carson unpacks the eight important parts of Thinking Big — Talent, Honesty, Insight, Niceness, Knowledge, Books, In-Depth learning, and God —and presents the stories of people who demonstrated those things in his life. By applying the idea of T.H.I.N.K. B.I.G. to your life, and by looking at those around you as well, you too can overcome obstacles and work toward achieving your dreams.